It is possible that the signal handling of a neuron is outside the engineering comprehension of the most astute of human brains, even after the relationships of inputs to outputs are statistically characterized and the mapping of genetic information to neuron structure and composition is complete. Deep comprehension of the detailed function of neurons within their role in adaptive system behavior seems to be lacking, and no rational proof of the feasibility of comprehending neurons has yet been published. A visual representation of neuron functionality might look like the visual representation of a genome, a blur of information, when viewed in its entirety. The economy of the world is much more complex system, astronomically more daunting. 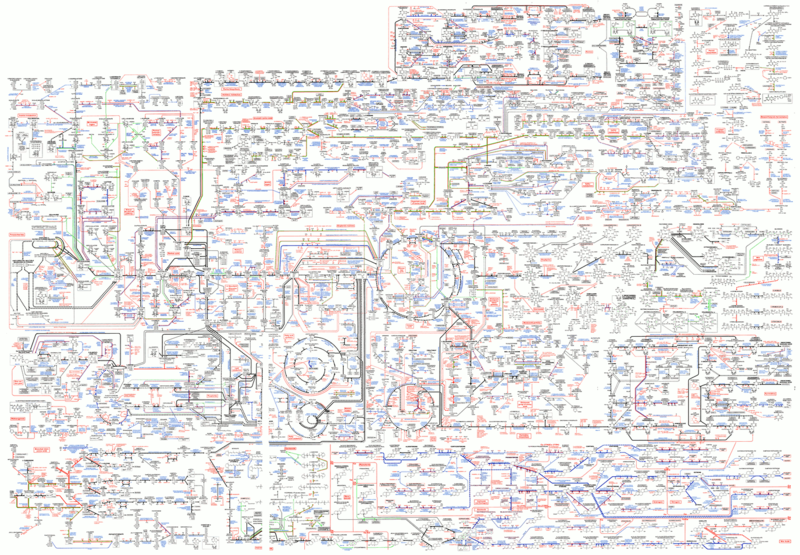 Even the map of the metabolic processes of earthen life (shown below) defies comprehensive display in a single view. Comprehending these complex biological systems can only be done piecemeal. Studying these systems in their entirety may take a single mind years (or even millennia), and the distortions of memory over time may prohibit placing the whole system within the finite capacity of the cerebral cortex. Yet computer science has no doubt advanced. Many features of the mammalian brain have already been simulated, and those simulations exceed the capacities and speeds of mammals. Examples include mail sorting, flight planning, and game playing. With such progress, the simulation of the less obviously mechanical functions of the human mind appeared to many to be within the grasp of scientific advancement. Other AI theorists have expressed their doubts. The question of whether a system of a few billion elements can be simulated without first simulating a generalization of its elements arose in the twentieth century. The spiking neuron model is an example of research inspired by that question. Is the most elemental unit of biological computation, the neuron1, comprehensible by a brain of comprised of neurons? If the answer is no, which is quite possible, then new approaches to AI may be required to simulate the capabilities of the mind that are less obviously computational in nature – capabilities like intuition, inspiration, compassion, jazz composition, or revolutionary thought. No, here is why. No approach can simulate the mind with 100% accuracy. a major notion that AI theorist refuse to note is that you cant take an orange and by virtue of technology turn it into an apple lets apply the same logic here. neurons are temporary things in our brains, daily we are trimming our brains and growing our brains, in order to "Engineer" a human Brain a probability whatever or not that neuron would die or not would have to be present. But that probability is flawed as well because, Nature is not math. In this case we are trying to apply something to Math that is unpredictable. Math is something we have used to try to rationalize the way nature works but it out right fails. If nature is completely math then predicting a hurricane would be easy. So to answer your question, no because a Neuron is more then a light switch, it is not mathematical in nature. their is no universality in everyone. plus their is more variables that you would have to account for that are way beyond a simple decision and a simple mathematical formula. Not the answer you're looking for? Browse other questions tagged philosophy research artificial-neuron cognitive-science neurons or ask your own question.